Radiators Plus carries a range of products made for maintaining your cooling system. Our Red Kote (fuel tank sealer) is a new polymer coating developed by Damon Industries which is resistant to petrol, diesel fuel, alcohol and other fuel additives. Its major use is to seal leaking fuel tanks. Solvents such as methyl ethyl ketone (MEK), acetone, methylene chloride and propylene oxide will completely dissolve the polymer. Other industrial solvents will affect the coating but not completely dissolve it. Red-Kote® is easy to use if the directions are followed closely. It seals the multitude of small leaks that often form where the straps wrap around the tank. 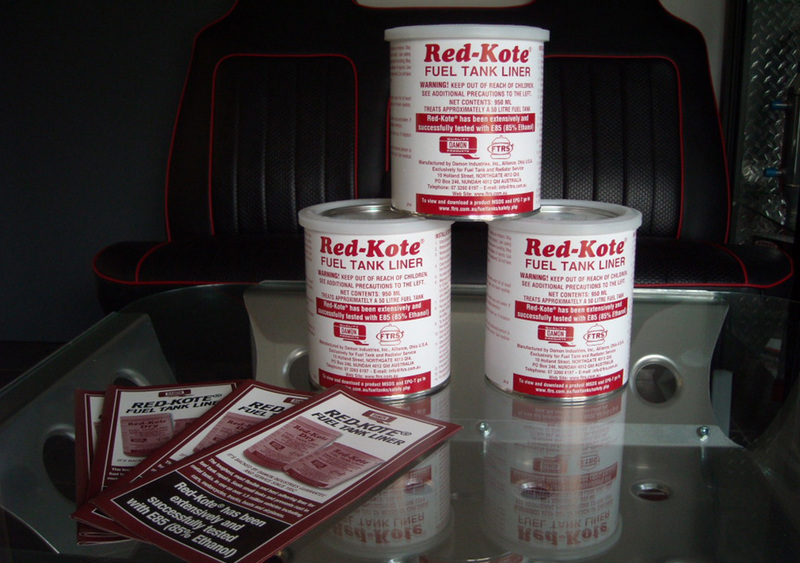 You fix the obvious leaks and Red-Kote® seals the rest. Contrary to what some people will tell you, rust does form inside petrol tanks. The cause is condensation and water in petrol. Red-Kote® seals rust under the coating so it cannot flake off to plug fuel-line filters or cause engine damage. Further rusting is reduced also. Red-Kote® is a safe and sure way to solve your problems. Red-Kote® also offers the advantage of not interfering with the reinstallation of the tank. External coatings, especially fibreglass, are sometimes too thick to allow reinstallation with the original straps and bolts. The coating is very flexible and does not crack as do some of the others. This gives the repair a much longer life. Tanks coated in 1984 are still doing well. The polymer was specifically chosen because of its tight adhering qualities. In comparison to some other coatings, Red-Kote® does not peel off even when the metal is bent. This protects against loosening of the coating by vibration or denting of the tank. Red-Kote® is resistant to methanol. In fuels with a high percentage of methanol the coating is bleached, but remains tightly bonded to the metal. Some petrol tank liners are dissolved by methanol into sticky lumps and strings that plug the fuel line. This will not happen with Red-Kote®. Red-Kote® dries faster than many other sealers saving you time. You can reduce time further by thinning with acetone and using two thin coats instead of one thick coat. Red-Kote® levels very well. You will not get a wide variation in thickness as with some other coatings. Red-Kote® is thicker and usually requires only one coat as opposed to two coats for many other coatings. Holes up to 2mm may be coated and sealed safely. Rust is sealed in so that it cannot flake off. The bright red color is easily visible – you can be sure you didn’t miss a spot. Some coatings are almost invisible. The new dye does not leach into gasoline (turning it pink) when the vehicle is not used for long periods of time. 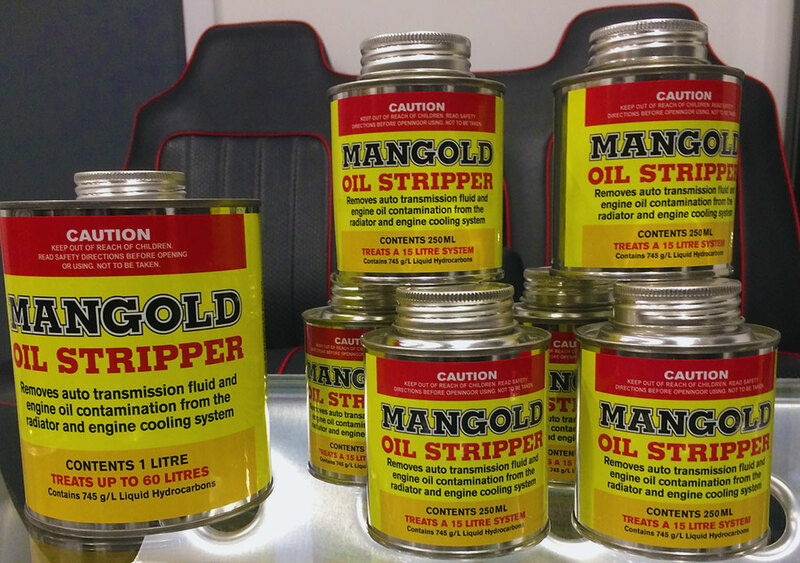 Mangold Oil Stripper is a highly efficient oil stripping product designed to break down engine or transmission oil in your cooling system. For diesel and petrol engines. After running Mangold in your system for 15 minutes at normal running temperature it is important to thoroughly flush out the cooling system to get rid of all oil residue. Oil coolers: Radiators Plus has access to a large range of engine and transmission oil coolers for motor vehicles. From standard external OE spec. coolers to highly efficient aftermarket performance coolers and now water to oil coolers. Thermo Fan: Radiators Plus also have access to a large range of performance aftermarket and OE spec. fans. Our best performing fans are Spal or maradyne and range in size from 7″ to 16″. We can also mount fans to any brass/copper or aluminium radiator. Please ring for more information. Radiators Plus: for all your cooling system needs.